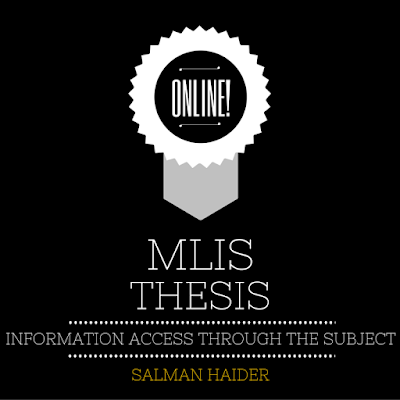 The present study in the form of annotated bibliography comprises of all the significant literature dealing with “Information Access Through the Subject”. Although the bibliography is selective in nature, an attempt has been made to cover all aspects of the topic. I hope this bibliography would be helpful to those who wish to know about the subject. The bibliography consists of 322 entries on the topic. LISA was consulted to approach the primary sources. For the purpose of abstracting, primary sources were looked into, using the collections of “Seminar Library of the Department of Library and Information Science, AMU, Maulana Azad Library, AMU, Aligarh, Central Reference Library, Delhi University and Indian National Scientific Documentation Centre, New Delhi”. The relevant bibliographical details were noted down on 5”x7” cards following the Indian Standard for bibliographic References (IS:2381-1963) and the Classified Catalogue Code. BATES (Marcia J). Subject access in online catalogues: A design model. Journal of the American Society for Information Science. 37(6); 1986;357-376. KEEM (Michael E). Aspects of computer based indexing languages. In Proceedings of the fifth annual conference on computers in libraries. London, 1991; 148-151. The bibliographical details of the articles are followed by informative abstracts and indicative-informative abstracts (in some cases). Care has been taken to give essential information contained in the articles. The entries in the bibliography have been classified and arranged using a scheme involving Broad Subject Headings followed by the Library and Information Science Abstracts (LISA). It may be recalled that prior to 1993, the abstracts in LISA, were arranged according to the unpublished draft version of CRG’s ‘A Classification of Library and Information Science (1971)’. This was followed until 1992. Since 1993, CRG classification scheme was replaced by a scheme developed by LISA based on the Broad Subject Headings. Annotated bibliography titled Information Access Through The Subject covering Subject Indexing, Subject Cataloging, Classification, Artificial Intelligence, Expert Systems, and Subject Approaches in Bibliographic and Non Bibliographic Databases etc. The project "annotated bibliography" was worked out as Master of Library & Information Science (MLIS) dissertation under the supervision of Professor Shabahat Husain, Chairman, Department of Library and Information Science, Aligarh Muslim University, Aligarh, in 2002. Information Access Through The Subject is a very much appreciated work. It earned the author S. Bashiruddin – P. N. Kaula Gold Medal, Post Graduate Merit Scholarship, First Division, and IInd Position in the MLIS program.